I can remember taking this particular slide in 1973 not because it showed anything in particular (although it, does, in retrospect, show something rather surprising which we'll get to shortly) but because it evoked a certain mood. There was just something about the quality of the light which, I think, still comes through in the picture today. The slide was taken from the right hand side (looking from the Town Bridge) of the Trent & Mersey Canal and it shows the green painted pipe-line bridge which we've already glimpsed here and here. What has surprised me, looking at the slide now, is that the pipeline did not run, as would have been logical, from the 'Middlewich' end straight to the gasworks on the right-hand bank of the River Croco. The pipe still had the Croco to cross from this point. Or, to put it another way, the pipeline bridge did not cross both the canal and the river. A look at the photographs on page 44 of Images of England - Middlewich by J Brian Curzon and Paul Hurley (Tempus Publishing 2005) gives us the answer, which is that the gas pipe itself ran from the end of this bridge under the right hand canal bank and then across the river between the retaining walls on either side of the Croco. In fact one of the photographs in question shows three pipelines crossing the river in this way (at least one of them may have been for drainage) with the main one (presumably the main outlet from the works which ran into the town via this bridge) having a small catwalk above it, affording it a little protection. There was also another walkway at canal bank level which, judging from the second photograph, was used to take the coal into the works through an entrance in the wall, presumably on barrows not dissimilar to the ones used in the open pan salt works. It must be remembered that, in the days of cheap and plentiful labour, this would be a common way of working. The notorious slowness of canal traffic would not be an issue as the system would be working like a conveyor belt, the 'belt' consisting of numerous canal boats. If the flow of coal is continuous it makes no difference at what speed the boats travel. 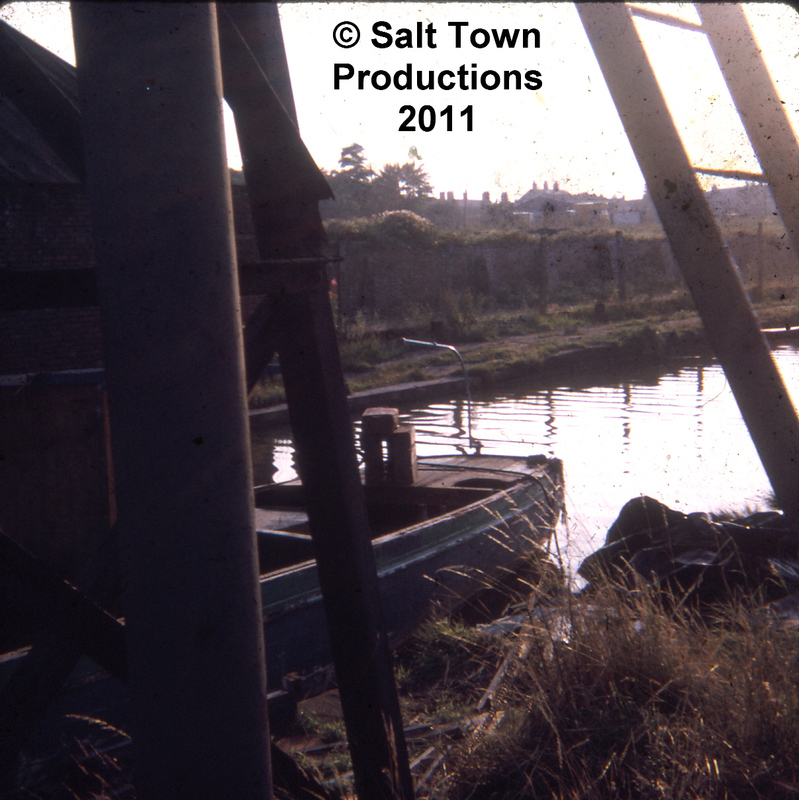 On the left hand side of our 1973 slide can be seen a salt warehouse - the only part of the Pepper Street works still standing at this period - and, in the centre of the picture, seen between the pipeline and the ladder the remaining outer wall of the works. A British Waterways maintenance boat competes the scene.